Watch Tax Institute's Senior Tax Counsel, Robert Deutsche speak to ABCTV on the 2018/19 Budget (9 May 2018). 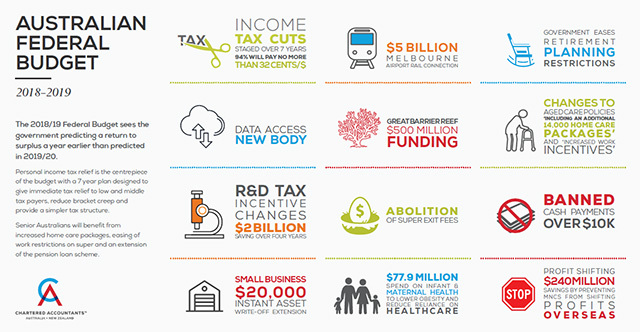 Please click on the infographic to download a one-page breakdown of key figures in this budget. With the spate of changes to tax law to take effect from the new financial year and beyond, we would be delighted to assist you if there are any questions regarding specific measures in the 2018-19 Federal Budget as it relate to your business, personal or family situation. Give us a call and get in touch today!